So for one of our first posts, we thought it would be appropriate to write about a very Canadian summer activity…..camping. We spent the Spring stocking up on the latest ‘must have’ camping equipment from iconic Canadian retailer Canadian Tire (yes that is how “tyre” is spent in North America). This included and is not limited to: tent, sleeping bags, blow up mattress, bbq, cooking utensils, lantern, plastics forks, spoons, knives, plates, cups, gas, torch, tarps …..you get the picture that the list is very long! So with about 22,240kg of equipment purchased, we were ready to head into the great outdoors to enjoy all the “benefits” of camping such as being at one with nature, finding yourself around the flickering flames of a midnight fire and most likely saving some money on a hotel! The only problem is that if you’re new to camping in BC you won’t have realised that every single person in the Lower Mainland does it, and so by March 16 all the Provincial Park Campsites in the whole of BC are booked! When we first heard this from a local, we thought this was some kind of joke, but after checking the BC Provincial Parks website in mid-August and seeing zero availability for any campsite within weekend driving distance of Vancouver, we were not laughing anymore! So, given this situation, we phoned around a number of private campsites a few days before the much anticipated initial expedition under canvas and after 5 fruitless calls, we finally found a site with spaces just 10 minutes’ drive from the popular Cultus Lake called Vedder River Campground. Despite a warm welcome from Vedder River Campsite attendant who upsold us some logs for $6 (am sure they are free from the local woods) the start of the camping trip did not go well. An 8 man tent had been purchased at a massive 66% discount in anticipation that a lot of room would be required for 2 people to accommodate some camping luxuries such as suitcase stand, mini bar, flat screen TV…. Constructing this tent / small marquee under the gaze of many inebriated country music loving campers (more on these folks later) was more difficult than anticipated. With instructions in a foreign language only understood by the Aztecs and diagrams that looked like the proud artwork of a child in Pre-school it was left to the traditional camping technique of googling on an iPhone to found out how to put it up! Firstly, a fellow camper in our group fell ill to a nasty bout of food poisoning suffered when inhaling a dubious taco on the drive to the campground in an attempt to modify a hangover’s status down from aggressive to bearable. Secondly, the aforementioned neighbourhood campers who had been enjoying a lot of red neck home brew got a little too rowdy. A spot of domestic violence by one particular sampler of the super brew resulted in the formation of group of vigilantes who took a dislike to men hitting woman. The alleged defendant responded to such a group by pulling out a knife, slurring some expletives and then jumping into his 8 litre V12 truck to make a quick getaway (after drinking his own body weight in 10% bear brew the getaway involved a lot of stumbling and dust). The Police soon arrived to take statements after the aggressor had been detained at the campsite entrance. 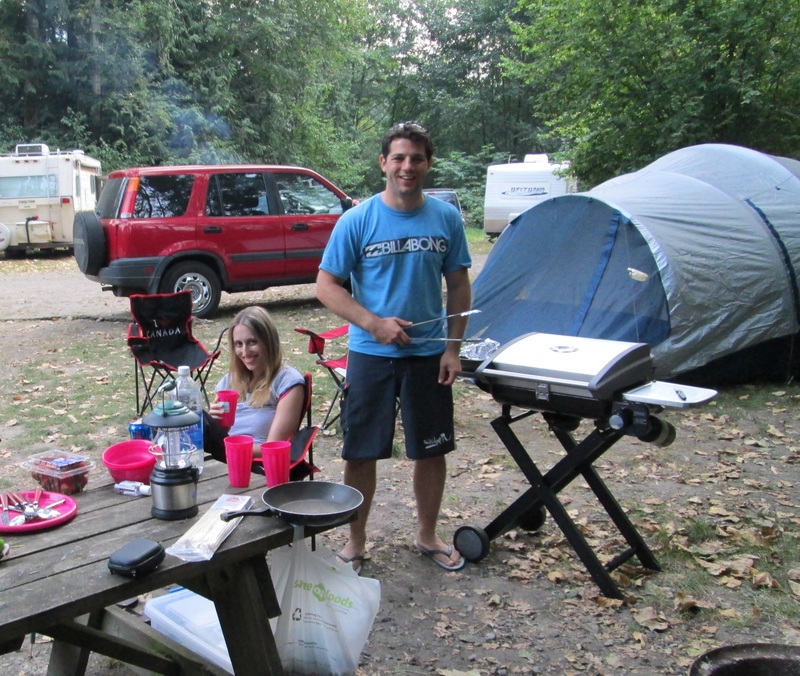 For family and friends reading this, we were at no point in danger but were merely bemused onlookers from around our fire trying to answer the question….is this really what camping is all about? With the drama over, the evening was spent pleasantly talking and drinking around the fire. The evening’s sleep was only interrupted by a) the sound of thunder which resulted in 30 minutes of scrambling around in the dark trying to cover the gaps in our shoddily erected tent using tarp and string, and b) the common camping issue of the inflatable mattresses slowly deflating to the point where you are basically sleeping on the floor. The final new thing we learnt about camping is that campers like to get up early, like 6am early! Why? We can only guess it takes 2 hours to build a fire and boil a kettle to make a cup of tea, or they just want to beat the Sunday morning queues at the nearest Tim Hortons!